Dynamic characteristics of a system can be described by means of impulse response characteristic (also referred to as the pulse response characteristic). The pulse response characteristic can be described as a system response to the impact that is applied to the input of the system (the impact is applied at τ time units prior to the response of the system). 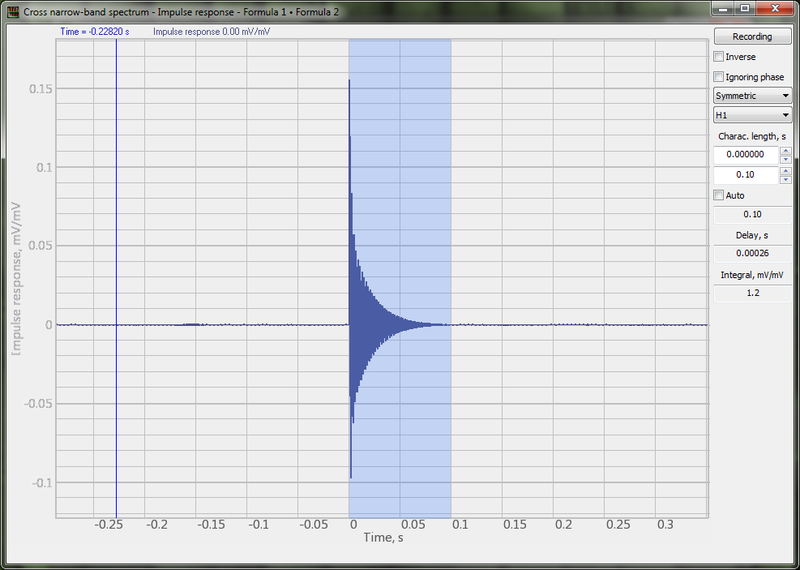 The impulse response characteristic allows to foresee the dynamics of the system output in the time domain. For the systems with discrete and constant time parameters, the impulse response characteristic can be quite useful, since it allows to calculate the system output for any input signal (since the output signal can be described as an input signal combined with the frequency response function). In order to enable the “Impulse response” window in the program “Cross narrowband spectrum”, activate the parameters configuration menu using the “Options” key. Select the option “Pulse response” in the “Additional windows” section (see the column “Add. graphic”) and click “Apply” key. The impulse response is one of the key system characteristics in terms of the time domain. In order to provide a comprehensive characterization of system behavior, one can use the impulse characteristic (pulse response) or transient characteristic (frequency response). The impulse response characteristic is useful for operations in the time domain, while the frequency response characteristic is more preferable for the operations in the frequency domain. 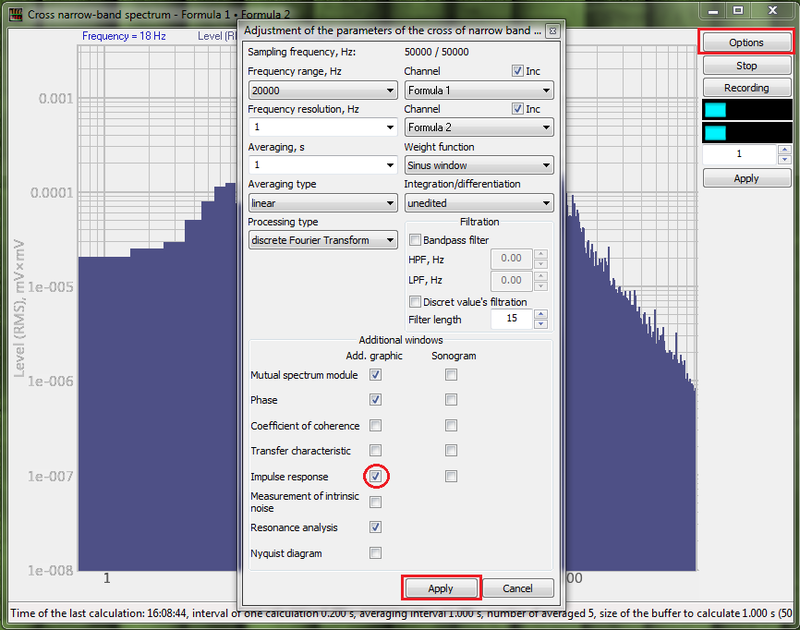 In addition to system response to the impact, the program “Impulse response” also displays the pre-history of the event allowing the user to set the characteristic duration. Using the recorded impulse response characteristic, it is possible to configure the impulse response of particular output channels (e.g., for suppression of the noise present in the output channel).